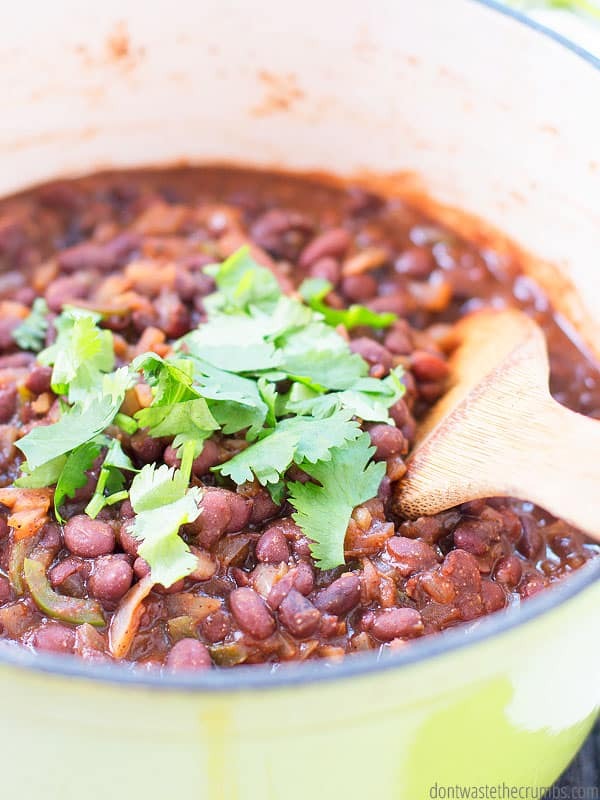 When I first started this blog, my husband told me he HATED beans. After he declared his hatred, I told him that if he wanted to keep our budget at $350/month, he’d have to learn to tolerate them. Somehow we found middle ground by adding them to recipes like minestrone soup and tortilla soup and southwestern salad. Now he ASKS for this black beans recipe almost every week. My how times have changed! I can’t say this change happened overnight, though. It was tedious and painful and sometimes exhausting trying to get him to merely consider thinking about the idea of maybe having beans as part of dinner… and not in a soup. But you guys–YOU GUYS– This black beans recipe? It’s a total game changer. Not only does he REQUEST beans for dinner each week, but we’re eating them MULTIPLE times… ON THEIR OWN!! NOT IN SOUP!! This black beans recipe is super simple and straight-forward, but let’s gets a few of the basics out of the way. Our favorite black beans recipe starts with cooked black beans. I’ve tried doing the entire thing, starting from dry beans in the Instant Pot, but it just didn’t have the oomph that the original method did. That’s why I’m recommending starting with cooked black beans. I crunched the numbers awhile back and it turns out that you can save quite a bit of money by cooking your own beans from scratch versus buying canned beans. Making your own beans from scratch is really easy and mostly hands-off, which is why I almost always recommend it. Personally, I prefer to cook my black beans in the Instant Pot. This is my original recipe for Instant Pot beans, and it’s failproof if you’re making just one pound of black beans. I make two pounds of beans at one time though, because I have this 8 quart DUO Instant Pot. Doubling the recipe requires one minor change: allow the pressure to release naturally and completely, instead of using the quick pressure release. If you don’t have an Instant Pot, you can follow my method for slow cooker beans, or this method for cooking beans on the stove-top. 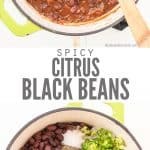 If you don’t have an Instant Pot or slow cooker, or you don’t want or have the ability to cook beans on the stove-top, you can start with canned black beans. Are canned black beans healthy? There isn’t anything “unhealthy” about canned black beans, but you do need to be aware of any additives or preservatives, and possibly salt. 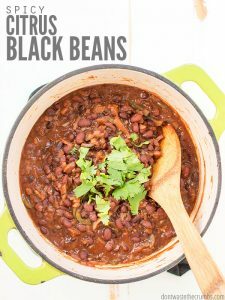 So, whether your choose to buy conventional canned black beans or organic canned black beans, drain them and rinse them three times before using them in this recipe. Can you freeze black beans? This black beans recipe comes together in about an hour, but don’t let that deter you from making them. 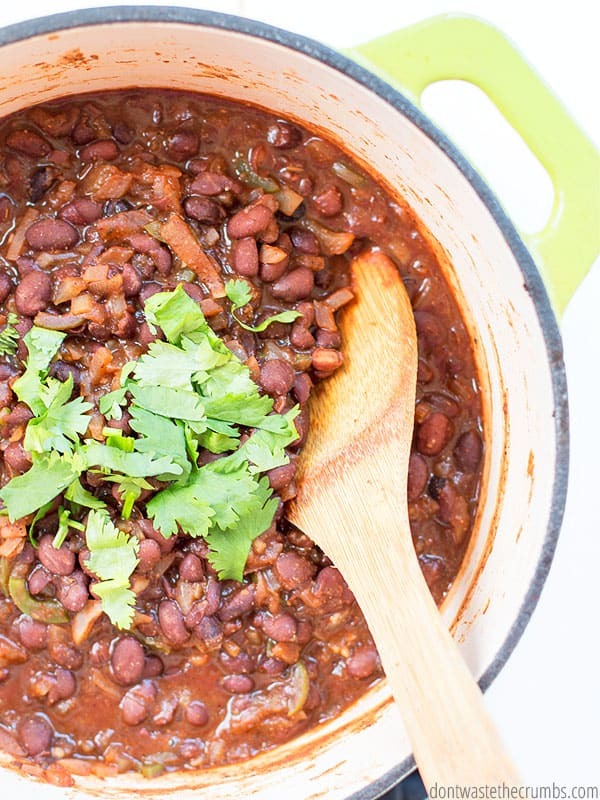 The bulk of the time is hands-off… you’re just letting the beans simmer in the spices and liquid and by the end, you have a nice, thick pot of delicious black beans. 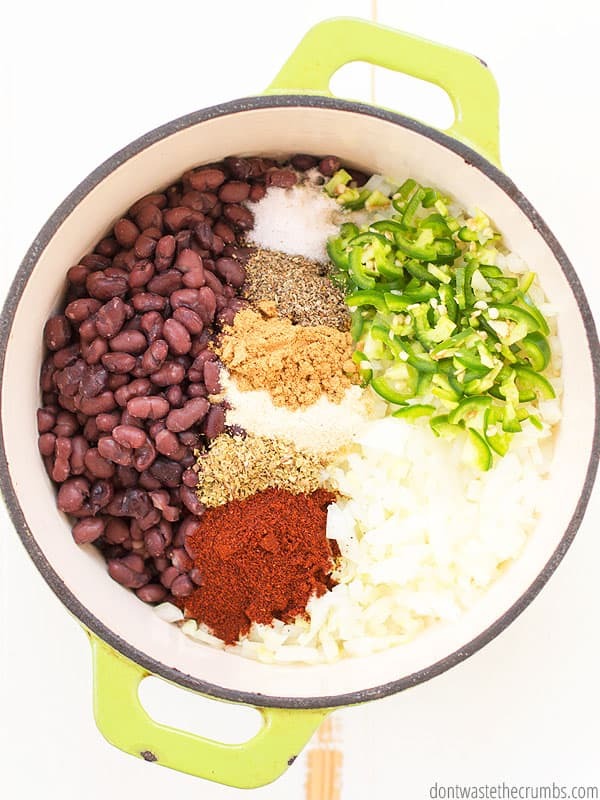 If you’re short on time, this black beans recipe is freezer-friendly! The beans will thicken, so I recommend freezing them in glass jars as opposed to freezer bags. If you follow my method in this post for freezing in glass jars without breaking them, you’ll be good to go. *If you’d like freezer meal ideas where all the hard work has been done for you (recipes, shopping lists, meal plans, and more!) check out these eBooks. 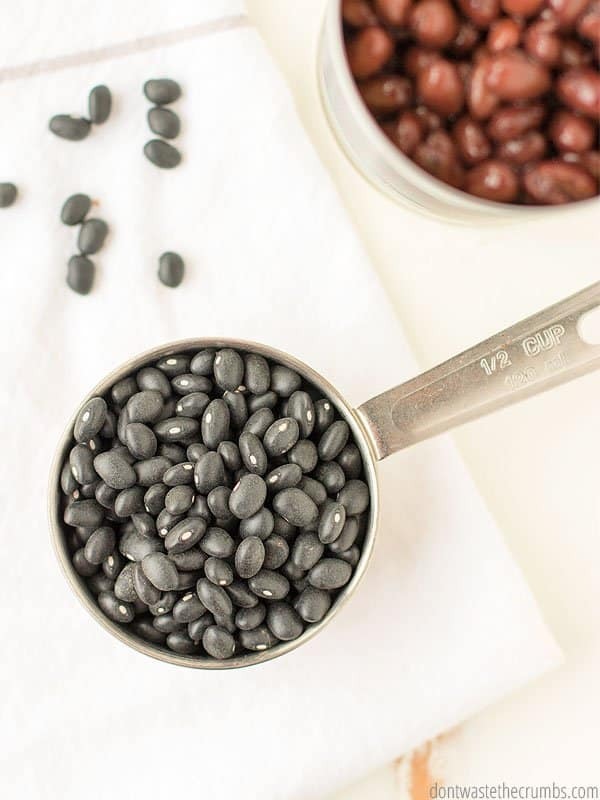 To thaw the beans from frozen, place them in the refrigerator on a kitchen towel (to catch any condensation) to thaw overnight. So by the time dinner comes, you can pour them into a pot and warm them on the oven. I’m a HUGE fan of making substitutions whenever possible so that you’re using what you already have on hand, reducing what you need to buy at the store, and in turn, saving money. Here are some substitutions that I’ve tried and that you can make as well. Chili Powder. This is NOT cayenne pepper and not a seasoning blend. Apparently there are several different types of “chili powder” on the market, depending on where you live. My chili powder is made from dried chilis. You can use regular, dark chili powder or even smoked chili powder. They’ll all great options. Orange Juice Concentrate. I highly recommend including this on your next grocery run, and since it can stay in the freezer, you don’t have to worry about it going bad. The bright flavor from the citrus is really, really good and I’d hate for you to miss it. With that said, I’ve also made this black beans recipe without the orange juice concentrate and the family still ate them up! Lime Juice. I most often use bottled lime juice here because we like squeezing limes on top of our tacos or rice bowls, but you can use freshly squeeze lime juice too. Rice Wine Vinegar. There’s something about the rice wine vinegar that really makes this recipe pop, so don’t skip this. Rice wine vinegar is very mild, but you can substitute apple cider vinegar (here’s how to make your own) or even white distilled vinegar if you use half as much as called for in the recipe. But if you’re really in a pinch, I’ve used lime juice instead of vinegar and again, the family devoured the beans! I love how my family GOES TO TOWN when I make this, and to be honest, IT’S JUST TOO EASY! Warm the olive oil over medium heat in a medium sized stock pot. Add the onion and jalapeno and cook until the onions are translucent, about 5 minutes. Add the spices and beans and 1 ½ cups water and bring to a boil. Stir and turn the heat down to a simmer and let the beans cook for about 45-60 minutes, stirring occasionally and adding the remaining ½ cup of water if the mixture becomes too thick. Turn off the heat and add the orange juice, lime juice and vinegar and stir well. 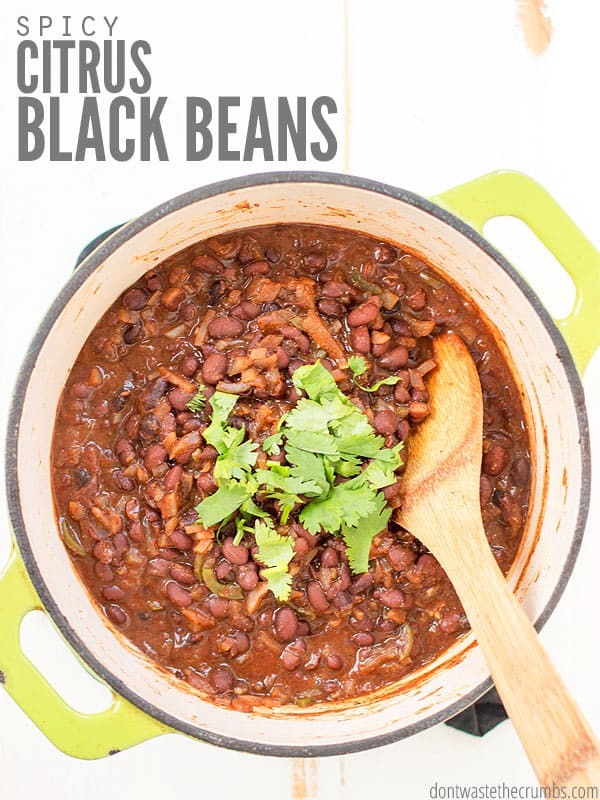 Our favorite black beans recipe is so good, you can’t go wrong serving it at any meal!